Who is King of the CX Hill? Interesting question. I have this geeky habit of comparing CX ranking data across different analyst groups and publications to garner insight. 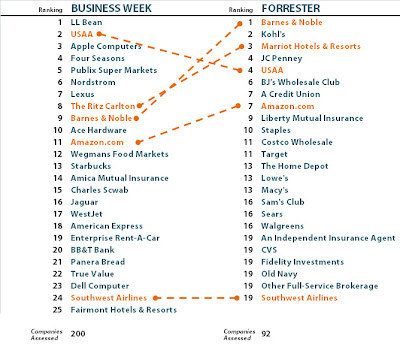 Last year, I compared Forrester and Business Week's CX rankings against Forbes "Best Companies to Work for List" looking for threads of continuity. It didn't produce a blog post but gave me great food for thought. Today, I compared Business Week's top companies for customer experience in 2010 (released February 18th) with Forrester's Customer Service Experience Rankings, released on January 28th. Of course, the methodologies and rigor used in both the studies are really different. Business Week partnered with JD Power, to conduct analysis of 200 firms -- starting with an initial high level survey that yielded "over 1,000 responses." It then used those survey responses to target companies and conduct more specific research using through JD Power's database and audience (an unspecified number of people - I hate that!). Companies are ranked by overall score -- and sorted a number of ways. The Forrester Study covered 92 large companies and 4,600 people were surveyed. Companies are ranked by a "Net Satisfaction Score" (I like this method!) which should not be confused by Net Promoter score. The results were interesting ... as USAA, Barnes and Noble, Marriott / The Ritz Carlton, Amazon and Southwest Airlines are the only companies shared between lists - but it's interesting that they are consistentlly ranked within 10 points of each other. Furthermore, all of these companies have consistently scored high in CX in past years. However, Forrester's top leaders (defined as the top 80% net satisfaction score) did not include experience darlings like Apple (scoring only 79%) or American Express (scoring 74%). There was also no mention of Starbucks or the other companies on Business Week's list. I'm also unclear as to why Forrester masked banks, credit unions and insurance agents in their listings. It'd be interesting to compare the companies reviewed alphabetically... but I have client work get to. So now that I've summarized -- here the links for you! Forrester's full report is $499....However, here's a link to free preview data from Author Bruce Temkin that includes some additional analysis as well as a list of those who belong in the naughty chair. 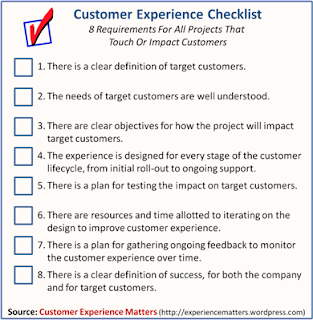 The CX Checklist 8...10... well... a few things to consider. 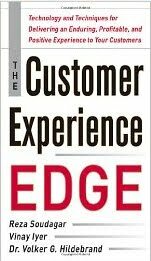 Forrester's Bruce Temkin published a free-thinking piece called the Customer Experience Checklist last week. Here's the graphic of the PDF of that checklist - to put my own suggestions in context. Thanks Bruce, for giving us more good stuff to chew on! I encourage all of you to visit his post and weigh in. The experience is designed to support users effectively and appropriately across online and offline channels. The experience is supported by a delivery plan that fully coordinates the collaboration of the business (customer service, marketing, product development, etc.) around customer needs. Barry Dalton weighed in on simplifying the list...and a few others had their say... as well. One user even posted a link to a Customer Centricity Audit to solicit feedback. I haven't checked that out yet. I hate audits that require my email address because it instantly makes me believe I'll be spammed. Guess that's ONE flaw in that audit. Again -- I'm not looking to scrape this post -- please go read it all here...I just didn't want to leave a gigantic comment. What say you, my friends? What would you put on YOUR Customer Experience Checklist? Five Truths about CX: Something to Noodle On. 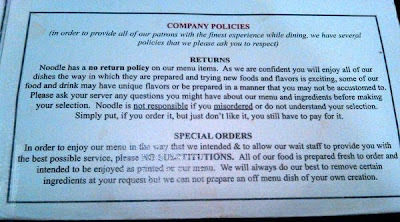 "Noodle has a no return policy on our menu items. As we are confident you will enjoy all of our dishes in the way they are prepared and trying new foods an flavors is exciting, some of our food and drink may have unique flavors or be prepared in a manner that you may not be accustomed to. Please ask your server any questions you might have about our menu and ingredients before making your selection. Noodle is not responsible if you misordered or do not understand your selection. Simply put, if you order it, but just don't like it, you still have to pay for it." Now, I'm not talking about the arrogance or abuse as a gimmick or a part of the 'schtick" of the business, which can be in some cases, mildly entertaining. Many of us have been to restaurants that pride themselves in snark and customer "abuse" and even foul language. Head over to Disney's Prime Time 50's cafe - and your server will employ old school discipline on you if you don't clean your plate. I'm talking about real indifference -- real arrogance at the expense of the customer. Can companies really afford to handle customer experience this way? Possibly! Only the company itself can decide whether the trade off is worth it ... but I'm thinking care is in order! The fact remains that when surveyed recently, 56% of customers say that they would "always or often" pay more for a good experience - even in a down economy. Further we hear from Fred Reicheld that a 5% reduction in customer attrition can drive a 20% upside in profit. 1. It’s hard to beat a first impression - Get off on a bad foot and you may never recover. That's why in every channel, you must lower barriers to interaction and engagement, and clearly mark the path that leads customers to a desired end. Demonstrating care and guiding people through the experience with care are important -- and timing and context are key! Compare the impact, a new patron of Noodle, of seeing that menu disclaimer immediately upon seating. As a first-time visitor, like Taryn, you may be appalled -- you might walk out. If this isn't your first experience with Noodle - but you are instead greeted by a warm hostess, a friendly, helpful server - the impact of that disclaimer may be slightly different. 2. Negative experiences often carry more “weight”than positive ones - Screw up once, and people may be talking about what you did wrong instead of what you've done right in the past. Turn someone off, even after a number of of good experiences, and they may not come back for more. But if you meet detractors with a high sense of ownership and stewardship for the customer experience you can turn negatives into positives. Noodle's policy provides no outlet for turning a negative experience into a positive one. There's also (seemingly) no exception for human error on the restaurant's part. If Noodle screws up, it seems the customer pays - and it's fair to say that this may result in the customer not returning to this restaurant. The message is pretty clear -- and only Noodle can decide if this is an "acceptable loss." 3. Customers usually remember “what you’ve done for me lately” - Sadly, for the most part, people are innately selfish. They tend to remember best what you did recently to show you care. People become brand evangelists, often for selfish reasons: praising brands that make them feel better about themselves. What have you done to make people feel valuable, wanted, needed, special or empowered lately? If the answer is "not much" you may be off the radar. Noodle's disclaimer seems to demonstrate a genuine lack of care for people. There's no offer to help people choose a menu option - the impetus is put on the customer to chose wisely and ask questions. Again, if people are left to rely on the menu for help, this creates a sad experience. 4. Thresholds for negative experience vary. If you have a monopoly on a product or service, people will tend have a higher threshold for poor customer experience. Further, if you have very vocal, active and loyal following, the thresholds and tolerances within the crowd can be higher for missteps. (Try critiquing Apple in your spare time to catch my drift). In contrast -- if you are in a competitive market, with products and services that are not particularly unique, with a quiet following - people's thresholds for negative experience will be lower. In the case of the Soup Nazi - the soup was worth experiencing rudeness, acrobatics and rules. In parallel, for some people, the iPhone was worth a six hour wait in line. In fact, many Apple fanatics considered waiting in line to buy the iPhone a badge of honor! This turned into a positive story for Apple and AT&T. We don't see people doing this for Motorola and Verizon. If there were six hour lines for a Droid, it wouldn't be a positive thing. Simply put -- if can buy your product anywhere else with a better experience, "Buh Bye!" If Noodle has outstanding food, few competitors and a monopoly on location/real estate, they can afford to have this policy. Perhaps they even use it to "weed out" picky eaters and those who are not serious about this type of cuisine. After all, they can only serve so many - and their best customer knows this food, and loves it. Only Noodle itself can determine whether the trade off is worth it. 5. Positive experiences will generally drive positive outcomes. We must take the ego offline and concentrate on the notion that our brand name is an outcome of the customer experience we deliver over time. If we focus on being consistently positive, demonstrate care for people, manage our missteps carefully, assume a high level of ownership and a dedication to "doing the right thing" we don't need policies like the one above. Because people will come back -- at least the ones that matter. Shoot for being "remarkably good" and use the word-of-mouth leverage to build a loyal and loving following. That means 4-5 stars out of 4 stars - not three. In the end, Noodle's disclaimer is one tiny, printed piece of its overall customer experience. Perhaps in all other areas - food, ambiance, service... etc. the experience is so positive it outweighs the disclaimer on the menu. I'm not so certain. I'm not in Atlanta, and I haven't been to Noodle. So, this isn't about my opinion. Perhaps it's enough to refer to the opinions of the myriad of other people who have eaten there. Based on the Yelp! reviews -- which equate to 3.5 out of 5 stars... perhaps Noodle ought to be more careful. In general, people's thresholds for bad customer experience are directly proportionate to the benefits and up-side they derive from that experience. How should a company know whether they are driving the kind of experience that will win the hearts and minds of the people? Listen. As Taryn's tweet demonstrates -- the great thing about the social grid is that customers are already out there talking. If we listen, we can use their feedback to make things better and drive positively remarkable customer experience.